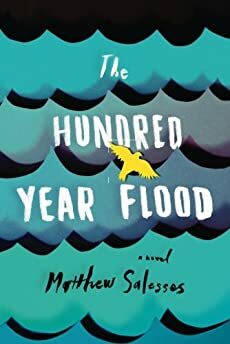 Largehearted Boy: Book Notes - Matthew Salesses "The Hundred-Year Flood"
Book Notes - Matthew Salesses "The Hundred-Year Flood"
Matthew Salesses' novel The Hundred-Year Flood is an impressive debut, compelling and lyrical. "What carries us through the novel is Salesses' gift for language: here is a meditative, poetic, modern fable crafted in haunting bursts of impressionistic prose." Prague was a music education for me when I lived there as a 22-year old. I had gotten through college with Jack Johnson and Ben Harper. True story. It was in Prague that I found indie music. It was boy music, emo music for boys who refused to call it emo music, but it meant something to me then in the confusing atmosphere of ageless Prague. One night in Prague, two of my three roommates and I bought a bottle of absinthe and tried it out, as any expat is bound to do, lighting the sugar on fire and everything. Someone put on The Postal Service album, and by the time our last roommate got home, we were dancing around the dining room completely lost, completely happy. We went out that night, and I passed out on the side of a road. I think I had my wallet stolen, or that might have been another night. The Wrens - "She Sends Kisses"
I dated a Czech girl in Prague who spoke ten languages. Our first night together, I sprained my quad, which was of course a hilarious story that absolutely mortified me. We were not meant to be. Later, she gave me the flu, and I lay up for days shivering, ignoring calls, not eating, sweating through my sheets. I was sure I was going to die. I went to the doctor afterward, and he asked why I hadn't gone earlier, since I had already recovered by then. I couldn't get out of bed was why. For some reason—I was 22—I never returned the calls, and we drifted away from each other. A few weeks after that, I saw her on the escalator in one of the metro stations. She saw me, too, but pretended not to. I didn't blame her. Sondre Lerche - "Two Way Monologue"
Though that terrible Steve Carell movie almost killed Sondre Lerche for me, and though "Two Way Monologue" is still the only album of Lerche's that I really like, it's also probably the only album on this list that I still listen to. It can bring me right back to Prague, more than anything else can. It was the album I listened to as I walked. I walked everywhere in Prague, often at two or three in the morning, when it was quieter and I could be alone with my thoughts. I was intensely lonely in Prague, though I didn't think I was lonely at all. But I loved the sad walk to "Two Way Monologue," the dark streets, the moody cobblestone, the possibility of ghosts. It's like a whole part of my personality reappears when I hear Lerche's unmistakable voice. The Weakerthans - "Plea from a Cat Named Virtute"
Prague has the best bars of any city I've ever been to. Cavernous bars in old wine cellars; green beer gardens hidden between buildings or on the tops of hills overlooking the city. And yet the bar we probably went to most often was a neighborhood place called "Black Cat White Cat." It still baffles me why we went there so often. It was brightly lit, brightly colored, with a vaguely hip slickness. It was like the kind of bar that would show up in a Murakami novel, as an example of where not to go. Belle and Sebastian - "The Boy with the Arab Strap"
I couldn't tell you what this song is about, but I always felt very foreign listening to it. I always felt very foreign in Prague, but somehow less foreign than I had felt in America. Because it's relative. Every American was foreign in Prague. What Sufjan Stevens was doing with place was something I wanted to do. I had never been to Illinois when I was listening to this song in Prague, but I felt like I could imagine both its reality and the grandiosity Stevens gave it. That must have gotten into my idea of how to represent Prague, which always seemed both extremely real and extremely unreal. Iron and Wine - "Naked As We Came"
One of the real and surreal things in Prague happened on New Year's Eve. I ended up writing it into my book. We went out to celebrate. We could hear the fireworks going off in Old Town Square, but we couldn't see them. For a while, we couldn't get through the crowd. When we did get through, we found out why we couldn't see the fireworks above. They weren't being shot up into the air; they were being shot down the streets, over people's heads. One of my friends decided this would be a good chance to strip his clothes off. I can't remember how much he got off—probably just his shirt, in the freezing cold—but in my book, my protagonist gets down to socks and boxers, and that is when a famous artist spots him and wants to paint him. This song was everywhere. Everywhere. You couldn't get coffee in Prague without hearing it. I took this song with me when I went to Korea, the year after Prague, and I sang it to the woman I met there, who would become my wife. Red House Painters - "Drop"
I only realized when I looked this up just now that it's a song from the nineties. Sometimes the time and place you listen to a song captures and replaces the time and place it was made. We make a thing, and the reader, or listener, remakes it.